New South Wales – On 14th December 2017, Maoneng Australia (Maoneng) entered into a Power Purchase Agreement (PPA) with the University of New South Wales (UNSW). The PPA allows UNSW to achieve its goal of carbon neutrality on energy use by 2020 and provides a long-term price hedge against a volatile NSW electricity market. Maoneng’s Project Finance Director Kevin Chen said the UNSW solar PPA is the first corporate PPA in Australia that involved collaboration between a renewable energy developer (Maoneng) and a gentailer (Origin Energy) in delivering a joint solution that meets the customer’s needs. UNSW has set a goal to achieve carbon neutrality on energy use by 2020. Over a six-month period, Maoneng and Origin Energy (Origin) worked closely together in developing an energy procurement solution that meets UNSW’s needs. Consequently, UNSW entered into a PPA with Maoneng for the supply of up to ~124,000 MWh of renewable energy per annum for 15 years. Maoneng will commence generation of this energy in 2019, putting UNSW on the path to achieving their goal. UNSW also entered into a three-year retail firming contract with Origin to manage the intermittency of solar production. 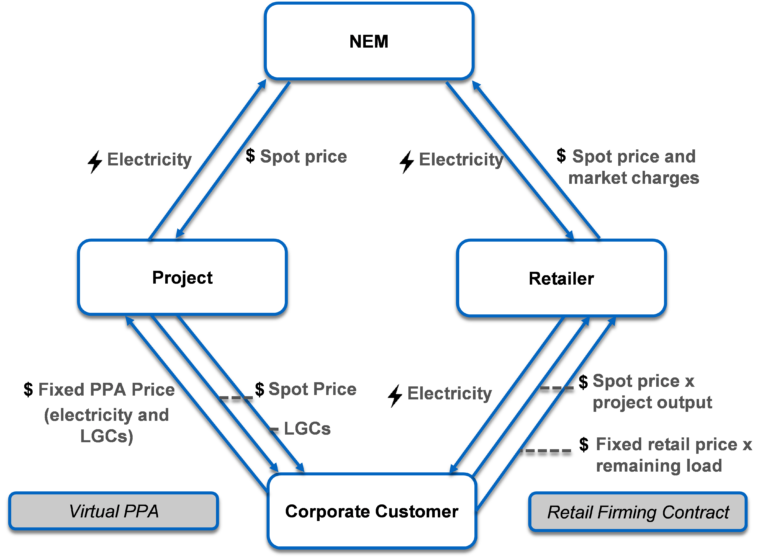 To date, the absence of a coordinated approach between the customer, the retailer and renewable energy developer has led to a lacklustre corporate PPA market in Australia. In addition, the hesitancy to collaborate and share information between parties have added to the challenge. “By collaborating with Origin and UNSW and maintaining an open dialogue, we have created a corporate PPA template that we believe not only works for UNSW, but can be replicated and tailored to fulfil the specific needs of each customer,” said Kevin Chen. In our last update, we discussed the importance of having a financial instrument that provides certainty in revenue and cash flow to secure financing for building solar farms. In this update, we will discuss one example of such a financial instrument, the corporate PPA. Electricity retailers typically offer one to three year electricity supply agreements to corporate customers. Under this structure, there is no direct relationship between the project and the customer. This arrangement is illustrated below. Alternatively, the corporate customer may procure energy directly from a project, either through a physical transfer of power or via a financial derivatives contract. Such an arrangement provides corporate customers with an opportunity to hedge against the volatility in electricity market and price risk. 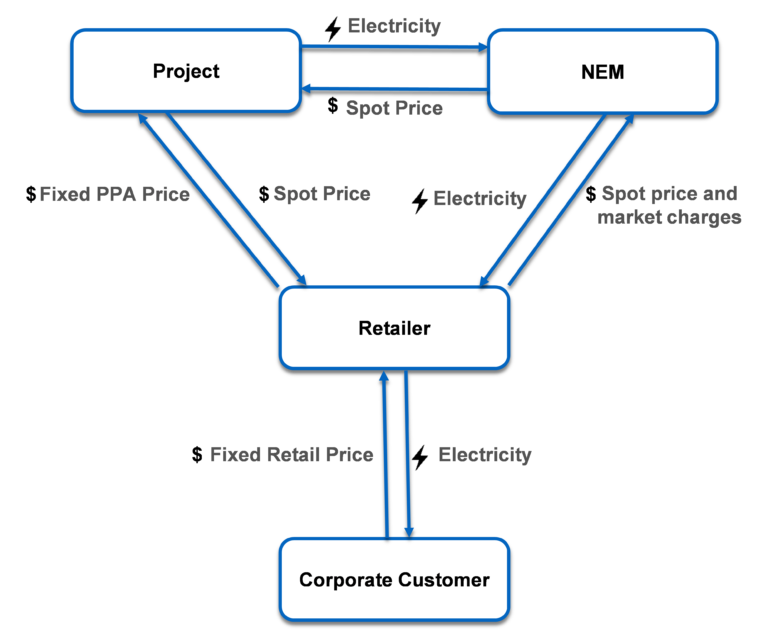 Corporate PPA in the form of a financial derivatives contract – ‘a virtual PPA’ – does not require the power plant to be built on-site (but typically need to be in the same state). It can provide the customer with access to competitive LGC pricing and saving on retail prices. An example of a virtual PPA arrangement is illustrated below. Interested customers can contact an experienced energy consultant and/or legal counsel to assist in the structuring of the corporate PPA. These parties will be well positioned to assess the risks and benefits associated with a corporate PPA and structure the PPA in a manner that satisfies the customer’s needs.